The hominy recipes have been among the most popular ones in Carb Wars. Although I don’t routinely check my blood glucose levels, some of my recipe testers do, and I also heard from others who reported that Juanita’s and Teasdale’s Mexican Style hominy did not spike their blood sugar. It seemed reasonable that turning corn into hominy could affect its starch content. It is made by a process called nixtamalization, in which the corn is dried and then soaked in a lye solution that removes the germ and outer shell and causes the kernel to puff up, much like popcorn, which would affect its volume. I also included a few recipes in Nourished, although I am cutting down on all grains now. New label from Juanita’s Hominy can, on current website. Label on Teasdale’s Hominy can, currently on website. Two reps from Juanita’s called me to give me notice that their label was going to change, but asked me not to mention it until it actually happened. They were very apologetic and even offered to have the company chef contact me to help with recipe development. Thank you, Suzanne B, for your persistence is pursuing the truth and kudos to Juanita’s for stepping up to correct their error. So what can we conclude from all this? As I’ve said before, nutrition data is soft science at best, and we have to consider all of it as nothing more than a rough estimate. It may be that my recipes include enough fat and protein to offset the effect of the carbs. However, I suspect that modern corn may be very different from the corn that was tested 60 years ago. Dr. Davis’s book, Wheat Belly, makes the case that wheat is a totally new plant thanks to genetic tinkering, and corn has likely been altered as much or more than wheat. What do you think? Have you been able to eat Mexican Style hominy without negative repercussions? Do you react to it as if it were 4 net carbs per serving or 16? Hominy, Juanita's Hominy, Nutrition Data, Pinewood Products. Bookmark. Cheapside: I think that is the most likely explanation. If we could find a source for heirloom white corn, we could learn how to make our own hominy, right? I first learned about Iroquois white corn from a book about foods recommended as low-carb for diabetics by Gretchen Becker, so it is surely lower in carbs than modern corn or at least much lower glycemic. Any word on the Teasdale brand? Is that also wildly outdated info, or can I still rely on that brand? I'd guess that Teasdale's used the same data that Juanita's used and just haven't rechecked it lately, so I'd be wary of thinking it is really lower. I can ask them, though. I never had a problem with eating a serving of Juanita's hominy, and 16 is still a lot lower than a regular serving of potatoes or rice. I only ate it occasionally as a treat anyway. Wow! Thanks Judy, for your work! 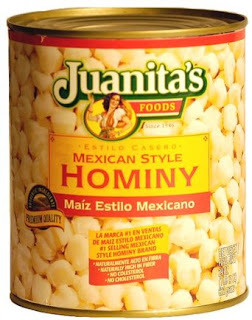 I use Juanita's hominy in several recipes. I did notice more of a rise in bg than I expected, but not terrible. I will check more carefully from now on. Do you think the difference in the nutrition values could be the results of the modified corn over the years? Iroquois White Corn is available again. Check out http://www.iroquoiswhitecorn.org/ I would love to see nutritional value for this corn. It has not been "tinkered" with so I suspect the 60 year old Juanita values might be closer to the truth. Thanks for the tip, PlantsHeal! I will check it out. I hope you are right. Yes, Iroquois White Corn is back! I sent them an e-mail to see if they have the nutrition data for it. I know I was amazed that canned hominy is one of few grain based things I can eat that doesnt significantly raise my blood sugar. Just regular store brand generic canned hominy, no idea who actually makes it or what variety corn they use. Then again its not like I eat huge quantities of the stuff. I mostly use it to improve texture in stir fry. Three or four tablespoons at most to entire stir fry. Sure it wouldnt be so friendly if I ate big bowls of the stuff multiple times a day. Then again not sure who would want to do that, diabetes or not. Figured out long ago, grains just arent going to be a significant part of my diet for forseeable future, probably never. Thanks for sharing your experience, ozarkhermit.